Hm, what’s this? 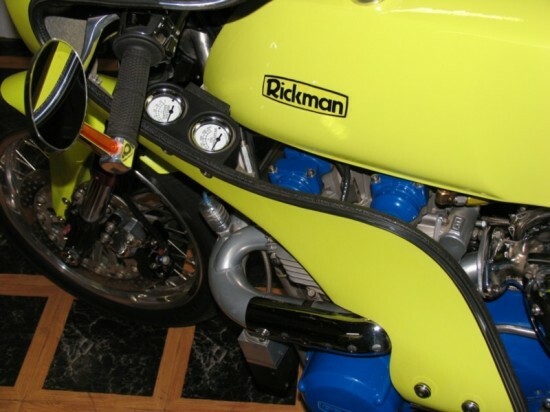 A Rickman Kawasaki 1400 CRT Turbo Cafe Racer. Read that again. 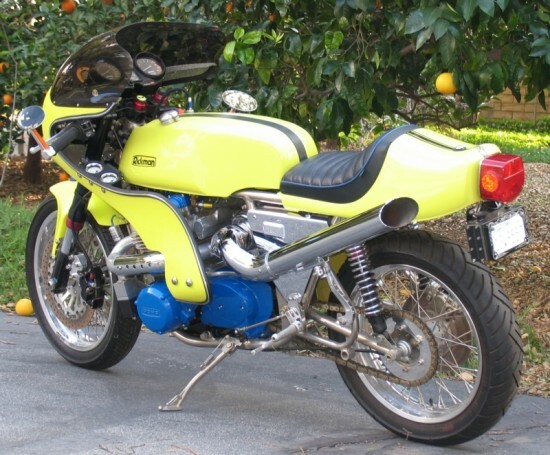 A Rickman Kawasaki 1400 CRT Turbo Cafe Racer? So this one’s pretty wild. 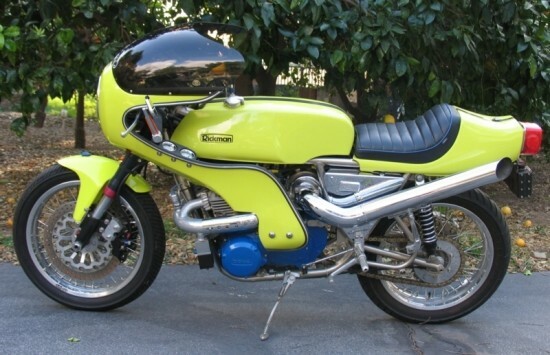 What started out as a pretty garden-variety Kawasaki Z900/1000… Okay, really there probably was never much that was actually “garden-variety” about this bike. Rickman was sort of like the British Bimota, a small company that took powerful engines from unruly and wayward-handling Japanese bikes and stuffed them into light, strong frames, wrapped them in new bodywork, and created what the original manufacturers could not: serious sport bikes. This relatively rare bike has been completely transformed, with nearly every component replaced and updated in some way. 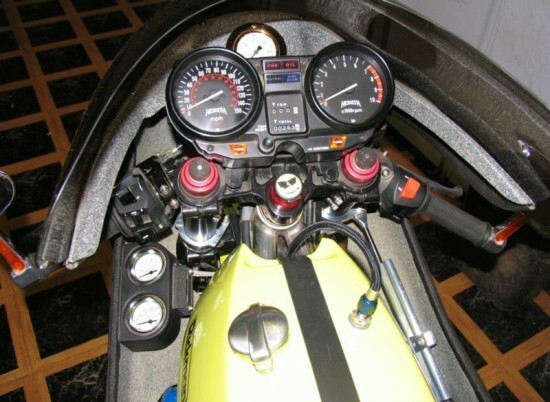 The machine sports a nickel-plated Rickman frame and lightweight fairing, which are rare enough to begin with, but the lump was heavily upgraded with a serious bump in displacement to 1400cc and a turbo kit, with water-injection to keep the intake charge nice and cool and prevent pre-detonation. The engine was completely rebuilt and the displacement increased to 1400cc by famous drag racing champion and engine builder Dale Walker from “Holeshot Performance” fame in Santa Cruz California. New parts installed during the engine rebuilding process : cam bearings, modified clutch hub, main bearing trust assembly, stainless intake valves, stainless over sized exhaust valves, valve seals, HD cam chain, HD head nuts, APE clutch kit, Dyna S ignition, gasket set, finished big block assembly, 1395cc Wiseco piston kit, HD clutch hub nut, HD set of valve springs, graphite head gasket, cam chain tensioner. Additionally the crankshaft was indexed, trued and welded, connecting rods bushed, the transmission gears were undercut, and the engine cases were powder coated blue. The head was turbo ported. A new SS Super Shorty E carburetor was added, which was jetted, set up and volume mated to a new larger then the original RAJAY turbo by HAHN Racecraft (HRC) from Oswego IL. A Mr. Turbo water injection system was installed to prevent pinging under high load. The exhaust header received a HPC coating which is guaranteed not to turn colour even under the highest exhaust temperatures. 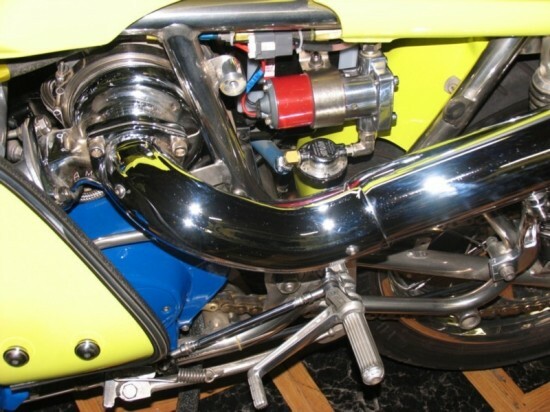 A custom flow thru exhaust pipe was fabricated-the sound is to die for. 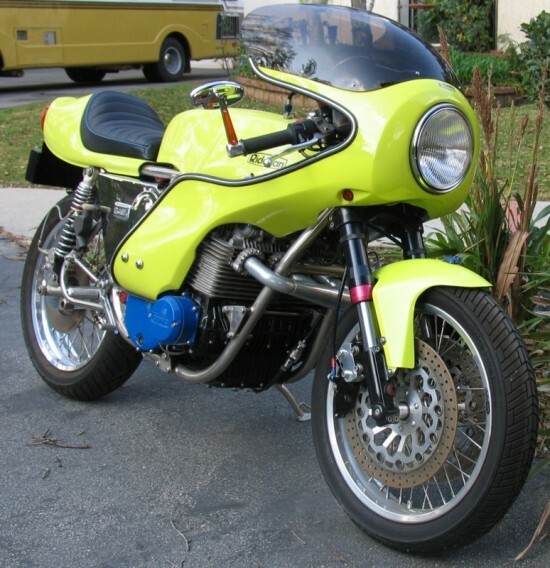 This lurid green monster even sports an instrument cluster from a Hesketh and some pretty trick gauges set into the fairing infill panels. The parts list in the ad is extensive, if you can get through what reads like one, heavily-caffeinated fever-dream paragraph. No real bidding activity on this one so far and only four days left, which is a shame. This thing seems like it’d be a blast to show or ride. Somebody’s going to get a deal because of the hideous colors the owner picked. Blue engine? Really? I guess it takes all kinds….. Surely a well built bike, and no expenses spared. But the odd color combination kills it completely. Something about the whole thing doesn’t flow. It’s how you (or I , for that matter) would have built it in the late nineties, but not in the seventies or today. So it hangs somewhat in limbo. Considering that he probably has the reserve somewhere north of 20 grand, it will not sell.